← Will My Generation Do Better Than the Last? Once upon a time, there were two firms, Meritocratus and Egalitarius. Both firms operated in the $10 billion widget industry, and each had 50% market share. Widgets were not a commodity. Purchasers were sometimes willing to pay a premium for a superior product. By the end of 2011, both Meritocratus and Egalitarius had identical products. The only thing separating them were their operating philosophies. Meritocratus was ruthlessly focused on the bottom line. Its overriding goal was to return value for its shareholders. It would pursue anything that would increase profits, provided its actions were legal. Egalitarius’ management wanted to balance its corporate goals with a broader focus on the social well-being of the communities it served. 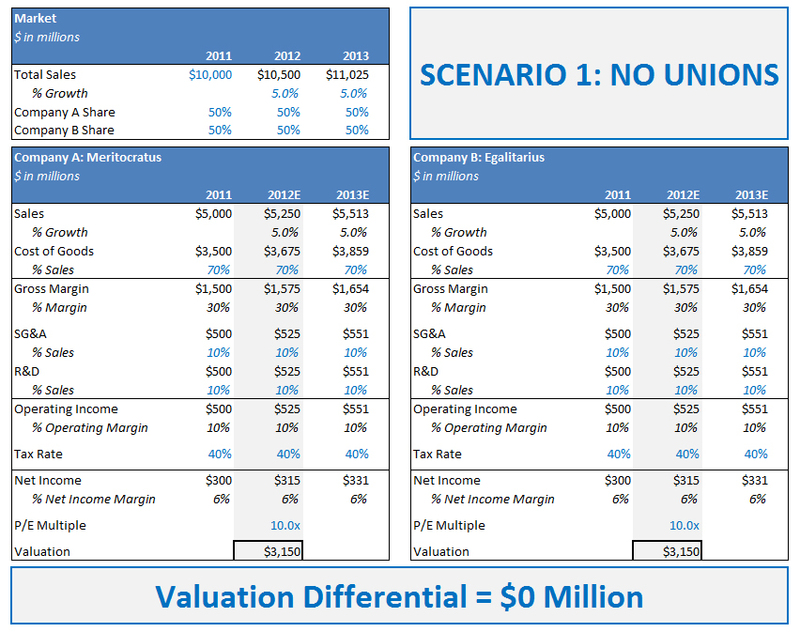 Below is a spreadsheet showing how both companies ended 2011 with identical profits and valuations of $300 million and $3.15 billion, respectively. Both companies operate and pay taxes in the United States. Labor comprises 50% of each company’s cost of goods, and neither company offshores its labor force nor does either have unionized employees…yet. This series will explore the effects of several management decisions Meritocratus and Egalitarius make in 2012 regarding labor relations, research and development, legal, and offshoring. The intent is to provide examples of how incentives drive society’s decision-making, and to shed light on America’s current economic malaise. This entry was posted in Business, Finance and Economics, Investing, Mathematics, Policy, Politics, Predictions, Taxes, Unions and tagged Capitalism, Egalitarius, Meritocratus, Offshoring, Unions. Bookmark the permalink. I will follow this with great interest!! I actually jumped the gun and published 5 out of 7 installments yesterday. I think you can pull posts back can’t you?? I use windows live writer and I can open posted item and change the publish date to in the future and repost. Then it will post later.